When you think of a big, fierce bear, you’re probably thinking of brown bears. North American brown bears are sometimes called grizzlies, and they are definitely big, fierce animals. Brown bears live in Europe and Asia too. All About Brown Bears: The North American Grizzly Bears. Brown bears are the second largest bear, after polar bears. Male brown bears weigh between 300 and 900 pounds. These big bears love salmon and other fish. In Alaska, Washington and Canada, they stand in rivers and catch the fish in their mouths or with their paws. Brown bears aren’t just brown. Some are cream or black. A documentary video about grizzly bears fishing for food. Question: When are brown bears the hungriest? Answer: When they first come out of their caves in the spring. They live off their fat during the winter. They lose up to one-third of their weight while they are sleeping. Talk about a crash diet! Question: Are brown bears dangerous? Answer: Brown bears are more aggressive than other bears, but they usually leave people alone unless they feel scared. Question: Where do brown bears live in America? Answer: In zoos, of course, and in Alaska and the Pacific Northwest. 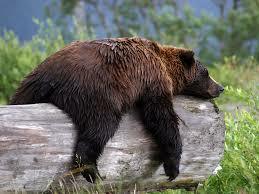 Enjoyed the Easy Science for Kids Website all about Brown Bears info? Take the FREE & fun all about Brown Bears quiz and download FREE Brown Bears worksheet for kids. For lengthy info click here. Declan, Tobin. " Brown Bear Fun Facts for Kids ." Easy Science for Kids, Apr 2019. Web. 23 Apr 2019. 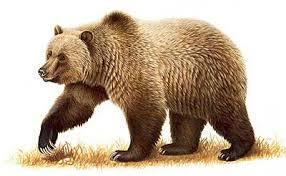 < https://easyscienceforkids.com/all-about-brown-bears/ >.